A Japanese propaganda lithograph rallying for occupation of the Russian Far East. The Japanese were defeated by the Soviet Russia and were forced to withdraw by 1922. The most substantial Japanese military operation during the First World War was the 1918 expedition to Siberia. 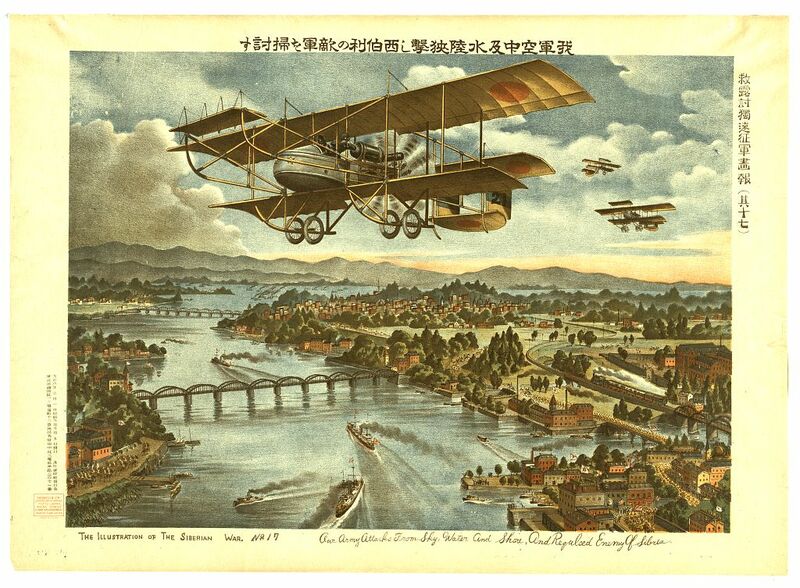 Although often described as a defensive response by the powers to the Russian Revolution and spread of Bolshevik power east, in the context of Japanese aims since August 1914, the Allied Intervention marked for Tokyo another golden opportunity to promote Japanese continental expansion. Just as a variety of Japanese interests had on the eve of the Chinese Revolution aimed to capitalize upon continental unrest to expand their orbit of influence, many in Japan considered the Russian Revolution another extraordinary opportunity. Foreign Minister Motono Ichiro urged prompt action in Siberia and North Manchuria to establish a “predominant position in the Orient.” Home Minister Goto Shinpei in December 1917 called for one million Japanese troops to occupy Russia east of Lake Baikal at a cost of five billion yen a year. And special adviser to Prime Minister Terauchi Masatake, Nishihara Kamezo, began formulating plans in November 1917 for an “independent” Siberia under Japanese tutelage. By far the most influential champions of action in Siberia were, however, elder statesman Yamagata Aritomo and his protégés in the Imperial Army. Although these men had played a central political and military role in Japan’s wars against China and Russia, Foreign Minister Kato Takaaki and the civilian cabinet had, with their swift declaration of war against Germany and successful negotiation of rights in China, decisively outmaneuvered the Yamagata faction in the first year of the Great War. As prime minister from October 1916, Yamagata protégé General Terauchi Masatake had, himself, seized the reins of Japan’s continental policy in 1917 by negotiating a series of loans to Beijing totaling 145 million yen (the so-called Nishihara Loans). Members of the Yamagata faction viewed intervention in the Russian Far East, therefore, as an ideal opportunity both to expand Japanese authority in East Asia and to shore up military–bureaucratic authority at home. By January 1918, a Joint Committee on Military Affairs began General Staff–War Ministry discussions for a dispatch of troops to Siberia. In April 1918, the War Ministry decided on support for White Russian Generals Dimitry Leonidovich Horvath and Grigory Mikhailovich Semyonov, who were fighting from Manchuria for an independent Siberia. By May 1918, Vice Chief of the Army General Staff Tanaka Giichi negotiated a military agreement with China that laid the groundwork for an immediate dispatch of Japanese troops to the core of Russia’s presence in Manchuria, the Chinese Eastern Railway. By the first arrival of Japanese troops in the Russian Far East in August 1918, in other words, the Siberian Intervention had become an overwhelmingly Imperial Army show, and Yamagata Aritomo and his army protégés would use the occasion to flood the Russian Far East with 72,000 troops. Japan’s new authority at Paris rested, of course, upon a record of Japanese participation in the Entente going back to the earliest days of war in August 1914. While Japan had, as we have seen, jumped at the opportunity to vastly expand its own interests and authority in the Asia/Pacific region, its record of military operations from 1914 through 1918 highlights an unprecedented level of Japanese cooperation with an allied cause. Japan’s siege of Qingdao was carried out in the autumn of 1914 by 29,000 Imperial Army troops in tandem with 2,800 British imperial forces. Two task forces of the Imperial Navy chased ships from the German East Asiatic Squadron and ultimately occupied German islands north of the equator on their own in September 1914. But Imperial Navy operations in the Indian Ocean exemplify the critical reliance of the far-flung British Empire on al- lied aid. Japanese ships played a key role in the mobilization of the British Empire between 1914 and 1918, conveying Australian and New Zealand troops from the Pacific through the Indian Ocean to Aden in the Arabian Sea. And, following attacks on Japanese merchant vessels in the Mediterranean, three Japanese destroyer divisions and one cruiser (thirteen ships in all) in February 1917 joined the allied fight against German submarines there. Where Japanese troops were not directly involved, substantial Japanese aid flowed. Several Japanese Red Cross units operated in allied capitals throughout the war, and Japan supplied badly needed shipping, copper, and monies to the allies, including 640 million yen in loans. To the Russians, Japan sold 600,000 desperately needed rifles. According to one contemporary Western observer, “if this help had been denied, the collapse of Russia would have come long before it did.” Indeed, the lengths to which members of the Entente and the Central Powers eagerly sought Japanese aid and support from the outset of the war is astonishing and exemplifies, again, the incredible global stakes of the conflict. The German ambassador to Japan, Count Graf von Rex, was so distressed by the prospect of Japanese support of the Entente in early August 1914 that, in an audience with Japanese Foreign Minister Katô Takaaki, he broke the chair upon which he was sitting and almost tumbled to the floor. German and Austrian representatives in European capitals approached Japanese representatives several times in the first two years of war over the possibility of a separate peace. Given Japan’s early commitment to the Entente, expectations among Japan’s allies were even greater. Despite initial misgivings about the scope of Japanese actions in Asia in early August 1914, Britain petitioned in September 1914 for troops from Japan to the Western Front. With the fall of Qingdao, allied requests for aid snowballed. On 6 November 1914, British Foreign Secretary Edward Grey urged Britain’s ambassador to Tokyo to ask that a Japanese force “take part in the main operations of war in France, Belgium and Germany in the same way as our Army is doing, and to fight alongside of our soldiers on the continent of Europe.” Soon after, French newspapers reported informal French requests for 500,000 Japanese troops to join Serbia in operations on the Balkan Peninsula. As late as July of 1918, the US Navy declared it a “matter of vital necessity” that Japanese battle cruisers help protect US troop transports across the Atlantic. Given the constant wrangling between Japan and its allies over the Siberian Intervention, historians have viewed the operation as the most egregious example of autonomous Japanese action during the First World War. In the context of incessant allied requests for Japanese aid from 1914, however, the expedition should be recognized, as well, as another glimpse of the enormous global reach of the First World War. The Russian Revolution of November 1917 and conclusion of a separate peace with Germany the following March marked a serious strategic blow to the Entente. Not only did it mean the collapse of the Russian front, given the rabidly anti-Western Bolshevik regime newly ensconced in Moscow; the future of the entire Russian Empire was thrown into question. Stretched to the limit on the Western Front, Britain and France turned to the United States to lead the effort to shore up allied-friendly elements within the Russian Empire. But in the context of four years of allied calls for more Japanese aid, the Entente held high hopes for Japanese participation, as well. At the very moment that the American Secretary of the Navy approached Japan’s ambassador to the US about possible Japanese battle cruisers to the Atlantic, Washington formally invited Japanese troops to join British, French, Italian, American, and Canadian forces in Siberia. Long before the Paris Peace Conference, in other words, the enormous global ramifications of the Great War had spurred desperate pleas for Japanese help and had catapulted Japan to a prominent position on the world stage.